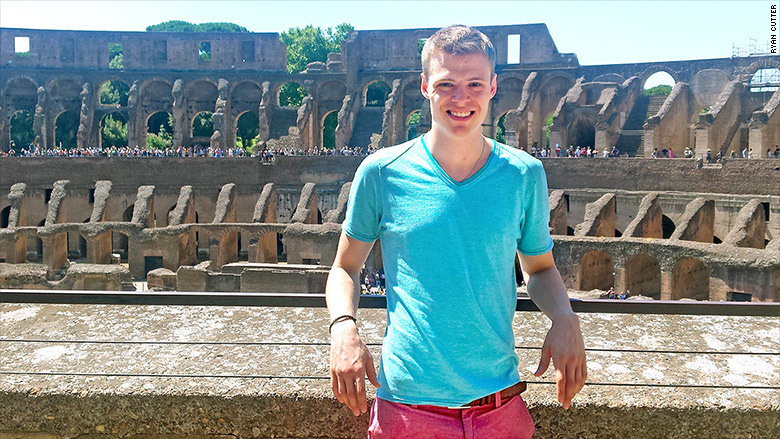 Ryan Cutter, 24, bought stocks in August during all the market volatility. The wild stock market gyrations may have scared many investors. But not the twenty-something newbies. If anything, the young investors are doubling down, opening new accounts and buying stocks. Robinhood, a stock trading app that is popular with Millennials, said the number of new accounts doubled on Aug. 24 when the stock market tanked over 1,000 points at the open. In the U.S., 65% of its customers bought rather than sold stocks that Monday. When the market sell off continued the next day, Robinhood users bought even more stocks. Similarly in Europe, 60% of its younger investors (under 40) bought stocks in August, according to Degiro, an online trading platform based in the Netherlands. Degiro has 70,000 users in Europe, more than double the number from a year ago. The company launched its U.S. trading platform, called Deziro, on Monday. Both Robinhood and Deziro attract Millennials because they offer commission-free stock trades. Deziro will charge fees for ETFs. Millennials jumping in to buy stocks during the current volatility certainly runs counter to how a lot of other investors were behaving. Mom and pop investors dumped their investments and moving to cash at levels not seen since the financial crisis of 2008. Last week alone, investors pulled nearly $30 billion from stock funds. That's the largest weekly outflow since Bank of America Merrill Lynch began tracking the data in 2002. But it was a buying opportunity for many young investors. Ryan Cutter, 24, was one of the buyers last week. He put $5,000 into his Charles Schwab portfolio and bought stocks like Disney (DIS) and pharmaceutical company Novavax (NVAX). Another young investor Justin Brosseau, 23, bought Netflix (NFLX) and Apple (AAPL) as those stocks plunged along with the stock market. This recent Millennial activity is certainly a welcoming sign, especially since there have been protracted worries over the fact that the generation hasn't been that active in the stock market in the last decade or so. Investing experts recommend it -- young people should have a higher appetite for risk and invest in stocks and gradually move into safer investments, like bonds as they get older and head towards retirement. Young investors seem unmoved by China's economic slowdown and its domino effect on the global economy, which was behind much of the stock gyrations, says Gijs Nagel, CEO of Degiro. "It's not something they feel is real to them," says Nagel. "They don't see that connection in their own personal lives." Instead they tend to buy tech stocks like Facebook (FB) because they understand the company and its product. Whether calculated or blindfolded risk taking, Millennials might be turning the corner on investing trends.